Two of my quilts have been accepted into the Quilts=Art=Quilts 2008 exhibit at the Schweinfurth Memorial Art Center in Auburn, NY. The exhibit will be on view from November 2, 2008 through January 4, 2009. 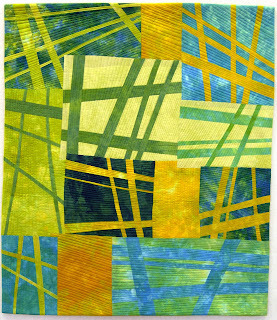 Jet Trails is 27 x 24 inches and is machine quilted. Jet Trails #6 is 63 x 46 inches and was machine quilted on my long-arm machine. I thought I had everything ready to go, and then realized the label needed to be sewn on. The final step is rolling up and wrapping the quilts for transport to the Museum. Our friend, Pat Berardi, who also has a quilt in the show, delivered my quilts along with hers.